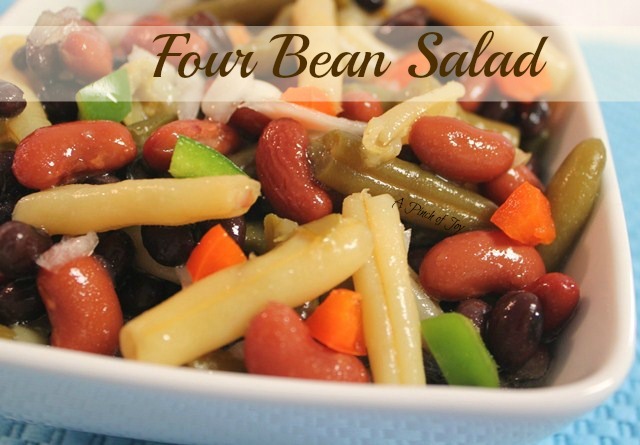 Four bean salad! It has onions, beans for fiber and protein, lots of vitamins and minerals, healthy oils for necessary fat, vinegar (shown to help control blood sugar). It is filling. Plus it makes quite a bit and keeps well so it will work for several meals. It’s good with almost anything. It is almost a complete light meal by itself. It’s a recipe from my mother in law – changed (of course) to add the black beans. I mentioned yesterday that Wheels had surgery recently. Articles from the Cleveland Clinic mention the importance of protein, fiber and certain vitamins and minerals that aid in the healing process.Four Bean Salad meets the requirements and Wheels loves it. It can also be jazzed up by adding 1/4 cup each diced green and/or red or orange peppers without significantly affecting the carb, calorie or protein count. If you use olive oil, be aware that it will become a semi-solid with refrigeration. It looks a little weird when you take it out of the refrigerator, but will return to its normal state as it warms. I set it out as I begin meal preparation it’s normal by the time we eat. A twist on the classic bean salad -- good for you in so many ways! And it tastes good, too! Whisk together oil, vinegar and sugar. Drain beans and place in large bowl. If using peppers, add to beans. Pour dressing over beans and toss lightly. Cover tightly and refrigerate until serving at least two hours. Flavor develops best after one day. Welcome to A Pinch of Joy! I’m so glad you stopped by today! Take a minute to look around. Follow A Pinch of Joy using the icons on the teal bar at the top of the page so you don’t miss a thing! I’d love to have your company on this venture!! Share: if you found this helpful or inspiring please click one of the sharing buttons below! Your support of A Pinch of Joy is appreciated! I consider myself a pretty good cook, but I have never made a good bean salad. Can’t wait to try your recipe. Please share it on my foodie friday linky today. It looks wonderful! I love bean salad but have never made one. Thanks for the recipe! Delish! That looks so good, and healthy too! I’d love to have you stop by and share this at my first link party/give-away running now through Saturday! This is exactly what I’ve been looking for since my New Year’s resolution is to eat a cup of beans a day and the bean soups and casseroles are getting a little old. Thanks for posting something healthy! Thanks for sharing your recipe! It looks really good! Always glad to see you at the Rock ‘N Share! I shared your post on my FB page today! This looks so simple. I cook with the kids every week and I bet they could do this by themselves. Thanks for linking this on Totally Tasty Tuesdays! I love this salad 🙂 Happy Spring!